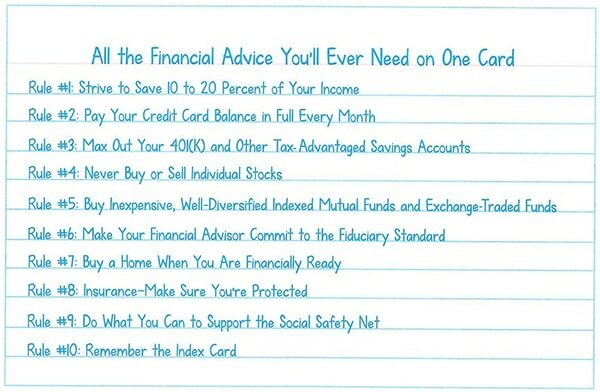 You may remember the “index card” of financial advice that went viral a few years ago. The story goes like this: Harold Pollack, a University of Chicago public policy professor, was conducting an online interview with Helaine Olen, author of Pound Foolish, a book about the financial advice industry. To show that financial advice is overly complex, Pollack took an index card and jotted down nine basic financial rules that cover all the average person needs to know. The image was shared worldwide, picked up by countless media outlets, and now it’s been expanded into an “index card” book. The ten rules covered in the book are pretty simple, even obvious — and that’s the point. There’s no magic fix or solid-gold investment that will make you rich overnight. Instead, the authors point you toward basic investment concepts like the time value of money, employer-matched investment accounts, and the “American dream” of a house as your primary retirement investment. The first few chapters cover debt: the different types of debt, what interest rates mean for your bottom line, and which types to pay off first. If you’re struggling to get a handle on your debt and put together a repayment plan that works with your budget, start here. If you’re lucky enough to be debt-free, you can move right along to the savings and investment chapters. Next, it’s time to put your money to work. Are you saving enough out of your paychecks for retirement? Most Americans aren’t — the authors recommend 10-20% of your income. But don’t just park it in a savings account; interest rates are so pitifully low that you’ll actually lose money, thanks to inflation. Instead, invest in your company’s 401(k) and/or set up an IRA (individual retirement account), using your contributions to invest in a balanced portfolio of mutual funds that don’t charge an arm and a leg in service fees. And don’t trust any old “wealth advisor” just because they work for a financial company — remember, their goal is to make money for themselves, usually by charging you fees. Many of us grew up with the idea that home ownership is the ideal retirement investment. You put some money down, accumulate equity through mortgage payments over 30 years, and (hopefully) sell at a big fat profit when you get old and want to downsize to a condo or an assisted-living facility. But it’s not that simple. House values go up and down, and if your life situation changes, you might not have control over when you sell. Home repairs are expensive, plus you’re responsible for property tax, association fees, and other costs. You’ll learn the pros and cons, and whether home ownership is the right goal for you. Insurance can be a form of investment, too. Life insurance or disability policies can protect you and your family in case you’re severely injured and unable to work, or you die. Nobody wants to think about this stuff, but isn’t it better to be prepared? Know what the options are and what kind of coverage will give you peace of mind. Again, there’s nothing mysterious or magical about the financial wisdom you’ll find in this book. In fact, it’s all summarized here (and on the card, of course). But if you’d like a handy, easy-to-read guide to the basics of debt reduction, savings, and investment, this book is a good place to start. It doesn’t talk down to you, and it doesn’t assume you already know all the confusing jargon and acronyms that people throw around. This would also be a great graduation gift for the young adult in your life, to help them get on a wise financial path and avoid costly mistakes. Recommended for anyone who wants to take more control of their money, but isn’t sure where to start.